SAL DeTRAGLIA'S VIRTUAL TAPAS BAR: VEGGING-OUT WITH A GOOD BOOK. 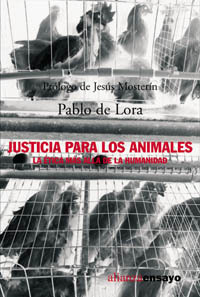 Congratulations to my brother-in-law, Pablo de Lora, whose book entitled Justicia para los Animales (pictured above) has won the 2004 Fundació Víctor Grífols i Lucas Investigation Award. The book is a well-researched and well-argued manifesto in support of animal rights. It has been favorably reviewed in many media, including the Spanish daily El Pais. The award ceremony takes place tonight in Barcelona, and will be followed by cocktails and an open-air pig roast. Just kidding about the pig roast. Well, Sal, I'm thrilled. Now that I'm in your weblog, my checking account will be fatten like a turkey (ups, sorry turkey). Coming from one the most passionate meat-eaters that I've ever encountered, I appreciate your kind remarks. Nina, there are so many books on animal issues in english (most of them are very good) that I am afraid you will have to remove the dust from your spanish skills. I promise a copy. IT IS a very good book I can assure you.